As you may have already read, I arrived frustrated, but all-in-all, unscathed. My first night in Novosibirsk was great! Oleg and Konstantin took me the long way to get to my flat (a "flat" is like an apartment, but better AFAIK). Before I got into the flat, the took me shopping at the local grocery store where I bought the necessities; you know: bread, ham, beer, cheese, water, pizza, and oatmeal. When I got in the flat, I was blown away at how bit it was. I have 3 TV's (living room, bedroom, and kitchen), but they only show Russian movies; I think they're broken?? My bedroom is almost the size of my garage at home. I have huge windows that look out to beautiful snow covered... everything. To top it all off, I'm on the first floor, so it's very easy to get in and out of my room. Plus, I can look out side and see the snow and don't have to worry about walking around and bugging those below me. Unfortunately I didn't have a phone or internet connection by this point, therefore I wasn't able to contact Jennifer and the girls to let them know I had made it OK. Oddly, I knew that they knew. However, I'm sure after she reads my last post, she'll have her doubts the next time I travel abroad. :) Regardless... I watched some American movie in Russian, organized my clothes, thought about my traveling whoas, and fell asleep around 3am. One thing that I did notice right away was their use of old-school and high-tech gadgets to get in and out of the flat. Honestly, I'm struggling to understand their locks around here. One part is a RFID system that gets you in and out, but along with that also goes a separate process using flat skeleton keys... really, the keys are long and flat like our old "skeleton key's" from back in the 50's in America. For instance, my flat is setup like a high security jail cell. To get in and out, it requires an RFID chip, 3 skeleton keys, a pass code, and a lot of time. Heaven forbid I'm in a hurry to get to the bathroom; I'd crap my pants before getting past the second door. Honestly, it was a bit intimidating when I first saw it. I thought "what kind of an area am I living in?" This "button" is pretty weird to describe. It looks like an over-sized watch battery. Basically it has some code programmed into it that must match the code behind the receiving end that triggers a signal to unlock the door. When this first door opens, I'm into a very small "closet" like area that has another door with a pad of many buttons on it. Step 3 - Use one of the skeleton keys to unlock the outside door of my flat. Step 4 - Perform the same steps as outlined in Steps 3. This door actually has a door handle on it, but it's not needed since it swings in. Honestly I don't understand it. I just wiggle my key into the keyhole, making sure to align it perfectly then turn it one full rotation while listening to all the metal latches go KLINK KLONK KLANK, then I push. Viola, I'm in. These doors don't have the standard door latches like most Americans are used to. They really just have these locks. Therefore, when you are in your flat, you are "in your flat" and if you go anywhere you have to lock the door behind you one at a time. When somebody comes to visit, you have to unlock the door, then lock the door behind them as well. It's all very weird to me still. I'm sure I'll adapt over the next couple of days, until then... it's flagged as "weird". I woke up around 11am and wanted to run so bad! My foot is feeling much better and I think I'm at a point to get back into my weekly mileage again. I wasn't sure if I was in a good area for that or not, so I decided to just kick it in the flat and get ready for my first day at the office. Oleg showed up around 1:30 and got my internet hooked up, then we took off for the office. After work, I was able to have a video conference with my girls. It was awesome!! Lizzie was getting ready for school and Jazzy was just up because...? Unfortunately Daizi, was still sleeping, so i didn't get to see here. 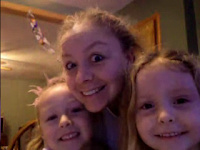 Jennifer said that she told Lizzie and Jazzy I was going to be calling over Skype, they jumped right out of bed! :) I talked to them for about 30 minutes and caught up on all the last few days' events. I told them about my place, but didn't have my camera setup yet. I'm supposed to be calling them back at 6:30am (Novosibirsk time) / 7:30pm (Ohio time) so that I can show the girls each room of my flat. :) I'm pretty excited to see them again. For a look at how weird the letters look and how hard it is for dumb-American's (like myself) to understand the pronunciation, check out this picture of a water bottle I bought last night (on the right)... It says "Clear Water"! Right?? Tune in tomorrow for more news from Siberia and more Russian words... in English notation. :) For an enticing peak into tomorrow's topic, Scott and I are going to take a run and I think I will break down some of the complex letters in the Russian alphabet (at least the ones I've learned so far). Ok, I have to go to bed because I'm calling my girls in... oh crap 3 hours. Goodnight!